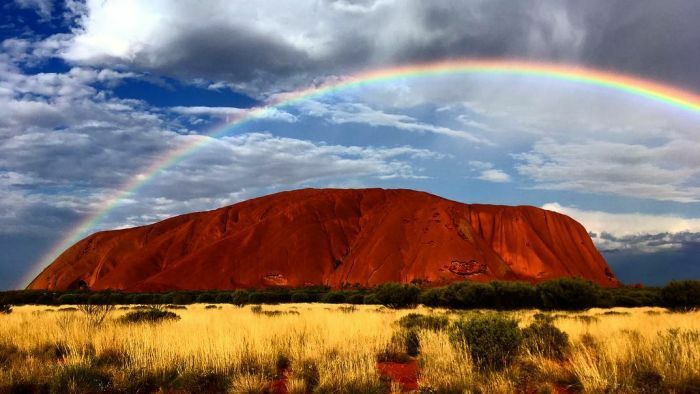 Scaling the iconic landmark and sacred site is set to be a thing of the past after the Uluru-Kata Tjuta National Park board decided unanimously to ban the activity, starting in 2019. Might have to give it a try soon, being considerate to cultural issues of course. being considerate to cultural issues of course. Of course, there are no physical access bans as yet, so still valid per general rules. Some thought will be needed around antenna mast support as well I think as if I remember correctly it’s all rock with no growth. Perhaps a 2m HT “rubber ducky” activation only to a group of 4 amateurs back in the Yulara village, then cycle round? It’s all rock so you could just drape an HF antenna across and it should radiate OK. No need for a mast. Works well for deep snow too (not Australian snow). There are crevices and shallow scoops out of the rock which have some soil and vegetation, however I’d personally not want to damage that so would try for a wire on the rock solution. The problem with that scenario is the number of stray tourists that could get tangled in it. I would be inclined to take a ranger to help with a dedication and to keep the other tourists off the dip[ole. A donation toward costs for a local project probably would help. In 1974 I contemplated taking a HF rig to the top to work Ayers Rock to a MM on Lake Eyre but the weight involved decided the issue. I just took a camera and a bottle of water. Even then we were discouraged from climbing. From an EU summit, VK8 is one seriously difficult state to work. It seem there’s not too many active Hams in the Northern Territories. From memory, I’ve only ever worked two callsigns from there and one of those was S&P. If anyone wants to set themselve’s a really tough challenge of working VK1 through to 8 during an activation, this is the one that that will almost certainly let you down. I suspect any erection of a mast would be frowned upon, especially by the rangers, hence my suggestion of simply using a HT - or perhaps a better idea - a KX-2 with the new Elecraft plug in the top antenna (or the Diamond one that’s been around a while on an FT-817). With this set up, you’d be relying on a lot of luck with conditions and some chaser stations with very good aerials and receivers though. I’d be surprised if contacts outside of Australia would be possible, but … you never know! Mike I think you are right. The ham population in vk8 is fairly low and only one is interested in SOTA from memory. That’s vk8gm. Matt Vk1ma occasionally revisits vk8 and he probably still has his rather unique callsign vk8gmt. In 1989 I worked a number of vk8 in Darwin on 6m but I was in v85 then. They used to enjoy working japan on 2m SSB via TEP. Haven’t heard you for a long time. May conditions improve! Yes active VK8’s are not numerous. Last night (brag hat on) I worked more Spanish stations on 10 m in under an hour than VK8’s in over 50 years on air. (brag hat off and going outside). The band was open to Italy and Spain in particular with a solitary station in Iraq and a couple of French stations. Not a G in sight. (Closes door on way out). Greg, VK8GM worked 12 times, 20m x 10 and 17m x 2…all ssb. Climbed the rock in 1995 and more recently in 2010, walked around it. The climb is closed off it is too windy or wet. The first section along the chain was quite steep. Once above the chain, the trek is far from flat, the surface is full holes. Lots of people about and usually quite windy. Something like a magnetic loop would be best suited for HF. Early morning is the best time to go before it gets too hot. I saw that it was 40 degrees c yesterday. If you are culturally sensitive, you will not take any photos, includes the circumference walk. Had to stay at the Ulara resort. I climbed it yonks ago and took 6 metres to the top. It was quite windy and people were losing their hats etc. Can I get restrospective points I have my log somewhere…! I can’t recall any traditional landowners discouraging from climbing back then. Looks like the dx machine you were using was an IC502. 3 watts of thunder! Yes, it was an IC-502! Great little radio although it weighed a tonne compared to qrp radios these days. Worked a lot of Sporadic E during that holiday. Climbed it in July 1990. No radio then! Mildly discouraged from climbing it back then, but everyone in our group that wanted to wasn’t put off. Sue and our two kids (14 and 16 at the time) did it too. I set myself the goal of getting up without using the chain… which I did… but on the way down I used it! Arrived at the base just after dawn and summited while it was still casting a long shadow. Very cold and windy. I couldn’t image a way to fix an antenna, so as others have said a handheld vertical antenna or a mag loop might work. Hi Andrew, yes I have still kept my VK8 callsign but only seem to get up to VK8 every couple of years now. I have climbed Ayers Rock a couple of times and played radio from the peak on hte last ascent. It was in October 2004 whilst I was on my way up to Darwin. I took my (then) new FT-817, a 7Ah SLA and a dipole that I knocked up the night before for 15m (no balun, just the 2 lengths of wire soldered to the braid and inner conductor). Conditions were poor and not helped by the dipole being propped up with a couple of sticks maybe 50cm off the ground at the feedpoint and ends. However I still managed to make 2 contacts - one to VK5KFB/4 who was portable in the Bowen area in northern VK4 and the second to the Philippines (DU9/G4UNL). I think that a couple of metre long squid pole with wire wound around it, a counterpoise and a tuner would probably be the best option for activating up there. Anusingly what caused me to leave was not using the battery up, but rather running out of water as it was rahter warm that day - I think it went over 30 degrees before 9am (which I think was the temperature at which they closed the climb). I have had a couple of discussions with Greg VK8GM about activating Ayers Rock (or to be culturally sensitive Uluru being the name that the traditiona owners like to refer to it as), however we have not progressed it since then. I fully intend activating it prior to it being closed for climbing - I think that would be best done in the cooler months to have the best chance of being able to climb it. If there is sufficient interest, I think that a group activation would sensible to maximise the chances of being able to get 4 contacts, but I do admit to some selfish desires to be the first to officially activate it - although I think Greg should probably have that honour! Although it means more batteries and weight, QRO capability would also be sensible given band conditions as they are. I think with the time of day for the activation (and poor conditions), contacts outside of the VK/maybe Oceania region would be problematic. I fully intend activating it prior to it being closed for climbing - I think that would be best done in the cooler months to have the best chance of being able to climb it. Keep me posted. I reckon a starting line in the carpark manned by a chaser with a ready set go and he who gets to the top first can claim it!